*Note: This isn't meant to make light of what they're doing or who they're doing it to, but rather pointing out how unpleasant and strange it is that SUPERHEROES are the ones doing it. Fancomics: Clint Gets Lucky, X-Kids Music, Logan and Scott Argue, Connor Hawke's Return and more! Ever have one of those days where you just need a good cry? Want to read something that just cuts deep, but leaves you feeling refreshed for having felt something so strongly afterwards? As I announced in an earlier post, some of us have designated today Arrow Kids Day, a day meant to send DC a clear message that we want the Arrow family whole in the reboot. We picked today because it is the day JT Krul's first issue of Green Arrow is released, thereby launching the reboot of the Arrow family. As many of you also know, the current plans for this series are unlikely to include either Mia Dearden or Connor Hawke, the latter because he apparently ages Ollie up too much and the former because she tends to be more obscure. In addition, Lian Harper, Roy's daughter, has been confirmed not to exist, ostensibly because she also ages him up, nevermind that he had her when he was still Speedy. But that's not going to happen if we have anything to say about it. Today, therefore, is a day not only to discuss and show your love for your favorites of the Arrow family, but also to let DC know that you love these characters, and you want them back. Send in a letter, post to their message board, tweet @jtrkul, @DCComics, @dc_nation and the like- hashtag #arrowkidsday preferred, if you can- anything else you can think of. The whole point of this day is to show how much we love these characters. So let's show how much we love these characters! Okay, following up my previous "fan outcry for the Connor, Lian and Mia" post, I'm thinking it's time we all held an Arrow Kids day. 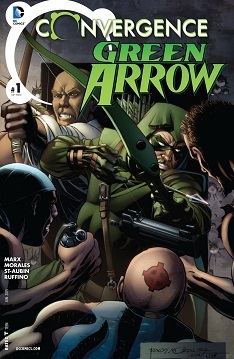 The release date of the new Green Arrow issue seems like a good one to me, though I worry it's a bit soon. So. What do you all say, then? 9/07/11 to demand our favorite Arrows back? I'm thinking just generally making some noise at DC will work- tweeting Krul (@JTKRul) and the general DC accounts (@DC_Nation, @DCComics), writing to DC, etc. will work. Some type of "I love _____ because ____" thing might work, too, both in the DC letters and just general signal boosting, though Twitter's char limit might be a bit of a pain. The Flash #135: Finally, a proper supervillain trial? This is a follow-up to my previous post about the Three of a Kind crossover featuring Flash, Green Lantern and Green Arrow. This issue concludes the story with a criminal trial. Unlike the comic book trials I've read here before this one is pretty straightforward: no clones, no sidetracking, no questionable judgements, and what's more, it gives a rare glimpse into the legal status of superheroes in the DC universe. Good superheroes just can't get a break. Literally; when's the last time a superhero went on a vacation, a family outing or a honeymoon that didn't involve an alien invasion, supervillain plot, the kidnapping of a friend/partner, a terrorist attack and so on? To illustrate, I show you the 1998 crossover Three of a Kind, published in three parts in Green Lantern #96, Green Arrow #130 and Flash #134 and written by Ron Marz, Chuck Dixon and Grant Morrison respectively. History of Mia: Part 7! So you wanted me to continue so here we go. Last time Mia actually became Speedy! Yay Mia! A lot of stuff happens this time. History of Mia: Part 6! History of Mia: Part 5! So last time we saw how Mia was none to happy about him and Joanna. They made up though, and now things start to get really serious. Lets come take a look at what happens. History of Mia: Part 4! Last time I posted there was stuff with Mia flirting with Connor, wanting to be Speedy, and then Connor getting shot. So what happens this time? Lets find out! Now with a new writer! Yay Part two of a History of Mia! Here we have more about Stanley Dover, because I just don't see how I can get around showing what happens with him.